Dean of the Pennoni Honors College Dave Jones announced at the end of January that he is stepping down from the position, which he has held since 2008. Jones was appointed to the position after Provost Mark Greenberg, the previous dean of the Honors College, moved into position of interim provost. Stephen W. Director was the provost at the time, but abruptly stepped down and was replaced by Greenberg. Greenberg then approached Jones with the deanship, who accepted. Jones has been a part of Drexel University since 1978. He started at Drexel as an associate professor of film. He also served as the department head for the former humanities and communications department, the Antoinette Westphal College of Media Arts & Design as well as the College of Arts and Sciences, according to the June 2008 memorandum from the provost’s office announcing his deanship. “At the time, I didn’t know much about it. I taught [honors students] often, there were many teachers that taught for the honors [program], but I didn’t know about the overall thing. I hoped to raise the academic standard of the honors program and that means offer more diverse courses, better courses, a little bit better teaching, because we claim to offer the best teaching, but we don’t always. So I tried to upgrade all of that,” Jones said. Before Jones took office, an honors student needed only seven credits to graduate with honors. This was increased to sixteen under Jones’ deanship. He also started an Honors College award for Excellence in Teaching, one of the incentives to get more teachers involved in the Honor’s College. “I think a challenge for being a dean of this college is that you can’t do too much without getting all of the other deans to go along with it. They’re not our students … anything we do infringes on someone else’s territory a little bit. The challenge is to come up with ideas that won’t encroach [on] other people’s areas, but enrich them,” Jones said. As posted by the provost, Donnelly will head the search for a new dean of the Honors College who is to be chosen from within the University. Candidates can either apply or be nominated. The search committee will then review the candidates and present three to four nominees to the provost. 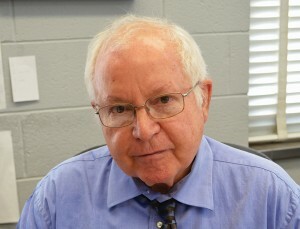 “The position demands a creative scholar with great collaborative skills who can promote the goals of the [University’s] strategic plan through the honors program, particularly interdisciplinary work, increased research opportunities for students and compelling, issue oriented coursework,” Donnelly wrote. “I’ve loved [being the dean of the Honors College]. It’s really been fun. It’s been a challenge, but I’ve liked it a lot,” Jones said. As the dean, Jones has changed much about the Honors College. For example, he facilitated giving away the writing program, originally run through the honors college, to the Drexel Writing Center, which is run by the Department of English and Philosophy. Jones facilitated the creation of the Center for Civic Engagement, which became so large that it is now an integral part of the University. He also created the Center for Interdisciplinary Inquiry, which runs the Custom Design Major program at Drexel and only accepts 10 students a year. The Honors College, under Jones’ leadership, also created the Center for Cultural Outreach, which creates publications that represent Drexel, such as The Smart Set and Table Matters. The Students Tackling Advanced Research Scholars Program was also started at the Honors College during his deanship, which now runs through the Office of Undergraduate Research. “The Honors College has grown considerably in size and importance. In fact, when I was researching honors colleges on the Internet, I discovered that Drexel University was ahead of the curve in having a well-defined honors program with its own dean and infrastructure. Dean Jones has done a wonderful job in developing the college and engaging faculty to teach honors students. And, he is interested in seeing the college develop even further,” Donnelly wrote. Jones has been assisting in the search to find the best candidate for the position by sharing the Honors College strategic plan with the committee. “First of all, you have a great staff. You really do. They’re dedicated and they work very hard. They themselves come up with a lot of the ideas. Over my six years, a lot of good ideas were what the staff came up with. Trust your staff and always think of the students. If you’re thinking about what you should do, you should think ‘Is it good for the students or is it not?’ And if it’s not, then you shouldn’t do it. On the other hand, don’t be afraid to spend money [on programs] that will be exciting for students,” he said. Jones cited the new travel courses among things that were spent on in order to excite students. “The ideal course is fun but it is also intellectual. It’s supposed to stretch your mind,” Jones continued. Before his time at Drexel, Jones attended graduate school at Stanford University for communication research and taught in Australia for three years, where he was a part of Film Australia. He also spent some time in Canada where he helped form the National Film Board of Canada.